Nalgene's original wide-mouth polyethylene bottle was the water bottle that took over the world—at least until newcomer Lexan came along. Now we're turning our attention back to these old HDPE (high-density polyethylene) bottles because of fears that Lexan (aka polycarbonate) leeches harmful chemicals into water. The jury is still out as to whether or not Lexan bottles are safe. That said, HDPE is almost universally recognized as a 'safer' plastic when it comes to water storage (The safest choice, if you're wondering, is to avoid plastic entirely, ala Klean Kanteen's stainless steel bottle or even glass). What is indisputable is that HDPE bottles are significantly lighter than Lexan/polycarbonate. Put three one-liter Lexan Nalgene bottles in your pack, and you're carrying a full pound of plastic—in other words, dead weight. Weight alone is probably a good enough reason to at least consider using Nalgene's HDPE bottles over Lexan, whether or not you're worried about BPA. Note that HDPE (unlike Lexan) does have a distinctly 'plasticy' smell, which will alter the flavor of your water to some extent depending on how sensitive your sense of taste is. This becomes progressively worse as the plastic ages, so if the smell begins to bother you, it's probably time to replace old bottles with a fresh set. Note that Nagene has phased out Lexan bottles in favor of the new Tritan plastic, which is BPA-free. The Tritan bottles seem to offer all the advantages of Lexan, though perhaps some safety concerns remain as this is a new plastic, and there isn't a lot of data on it. So, for now, I say the HDPE bottles remain the very safest choice for the most sensitive and/or conservative users. If you're wondering, as of 2012 I'm still using Nalgene HDPE wide mouth bottles. I prefer them for their lighter weight, they work well with SteriPen UV treatment pens, and it's easy to carry them on your waistbelt in hip holsters, which keeps water weight off your back (unlike bladder systems). So, for me, the original Nalgene remains mandatory gear on every trip. Nalgene Polyethylene Bottle - 8 fl. Nalgene Polyethylene Bottle - 4 fl. 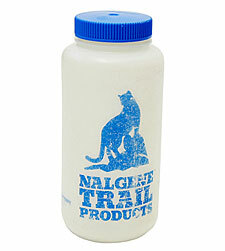 Nalgene Polyethylene Bottle - 2 fl.